Fair Winds to Ust-Luga Cup 2018 teams! The Ust-Luga Cup 2018, the Baltic Sea regatta of Russian ports and their partners, starts today in Hanko, Finland, informs the regatta’s official website. 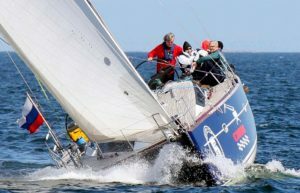 The 8-days sailing event will link the ports of Hanko, Helsinki and Tallinn and will end up with an award ceremony in the centre of St. Petersburg, Russia. The Cup’s general sponsor is Damen Shipyards Group. It will be the 7th edition of the regatta, the first one took place back in 2012 celebrating the 10-years anniversary of the start of operations at the Ust-Luga Commercial Sea Port. This race of non-professional sailors includes teams of JSC Ust-Luga Company, the owner and developer of the Ust-Luga port, Murmansk Commercial Sea Port, Russian Maritime Register of Shipping, Russian Railways, Federal Enterprise “Rosmorport”, Liebherr, the marine engineering company Morstroytechnology LLC and others. Overall, 14 teams from the ports and transport sector take part in the Ust-Luga Cup 2018. Currently, Russian Railways hold the Cup. The fleet includes modern cruising yachts of 45-50 feet long. Following today’s sail trainings and opening ceremony in the evening, the teams will start their first race in Hanko tomorrow. The regatta’s motto “One sea, one trade, one destiny!” reflects the idea of international cooperation in the Baltics. The race serves as an effective meeting place for networking, for set-up and development of business contacts. During the seven years, over 20 teams from Russia, Germany, the Netherlands, Finland and Estonia participated in the Cup.